Every time I think the pick-4 is an indecipherable mess, the longest price in the sequence is 3-1. At first glance this looks like a pick-4 with plenty of upset possibilities, but here goes. In my opinion, there is no stickout in the 6th. #2 Sacred Ground is listed as the morning line favorite off a 42 day rest and a drop to the lowest claiming level he’s seen since January 2013. Sacred Ground is a 7 year-old horse who has been a steady earner in the low claiming ranks. He is placed correctly in this race and the distance should be no issue, but he may lack enough pace to run at. He certainly has a chance but I wouldn’t make him better than a 20% probability. #6 Seeker should be the speed here. There is no reason why the five year-old gelding shouldn’t be able to establish his own fractions and hang on in the stretch. He won a $20,000 claiming mile race on May 23 in front running style, came back on the turf, and is back on his favored dirt surface today. The #4 No Brakes had zero wins from 13 starts in 2013, but already has two wins this year, albeit at Charles Town and Pimlico. The hard-knocking nine year-old gelding wouldn’t be a complete surprise. This race is another tricky event. In the nine horse field there are only a couple of horses I don’t think have a chance of crossing under the wire first. #5 The Brothers War shipped over from Europe in 2013 and finished third in a turf sprint at Saratoga. The well-bred son of War Front clunked in a minor stakes sprint at GP and faded to third after setting the pace in a 7-furlong OC turf sprint in his last. He looked like he needed the conditioning, but could get seriously compromised if he tries to stay with some of the other speed in the race. Still, at 6-1 he could make the pick-4. #1 Hear the Footsteps is at his correct level today and should find the distance to his liking. His closing style shouldn’t hurt him in this field. #3 Morpheus, half-brother to the great Frankel, is another shipper from Europe making his third start in the States. The 4 year-old still looks like he has some improve left in him, and wouldn’t be a total surprise. #4 Marriedtothemusic has the best figure in the race but has never started on the turf. He is another with early speed and could wind up setting the race up for a closer. #9 Spring Sky as only won once in his last 13 starts, but did just miss at today’s class and distance on May 16. He is another one who looks like he wants to prompt the pace. # 2 Honorable Dylan get a look simply because he is at the right level, and he raced well in his turf sprint debut on May 16. Perhaps today he turns the tables on Hear the Foorsteps and Spring to the Sky. This race is super-competitive and even the longest shot on the morning line, West Coast Chick wouldn’t be a total shock. Five of the seven starters appear to be front-running types, and the other two are more pressers than closers. Only one of the starters has ever won a Graded stakes, Miss Behaviour. #3 Milam is the morning line favorite, and although her pace figures put her near the bottom of the field, she may have an advantage because of her running style. She comes out after finishing a close second in the 8 Belles on Derby Day. The winner of that race, Fiftyshadesofgold, is multiple stakes-placed and would be 5 for 7 if not for some horse called Untapable. #2 Miss Behaviour comes off a front-running victory in the Ms Preakness and seems to be able to run without keeping her nose in front of a field. Todd Pletcher’s #6 Red Velvet wired a short stakes field in her last and has every right to keep improving. #1 Isabelle has yet to face open competition, but was impressive in winning a state-bred stakes last out. #4 Street Story has to be considered because if the front runners falter she is most likely to pick up the pieces. The nightcap is one of those typical NY state-bred maiden races on the turf where horses either look possible or horrible, but nobody sticks out. I’m going to look for horses who don’t have many starts, but have at least shown some potential. My choices are the #8 Zafiro Azul and #10 Josie’s Prospect. Both ran competitive figures in the same race on June 12, Josie’s Prospect on the front and Zafiro Azul making an impressive closing run. Of the two other horses coming out of that race, #2 Nanoon was strangled in the early going and had nothing left for a stretch drive, and #5 Sweetest Peach showed nothing at all. #7 Transplendid was approaching professional maiden status when she fell and was vanned off in her last start of 2013. If she returns to her best form she has a chance to finish in front. Lil’ Zilla is also returning off a nine month plus layoff with a new trainer in tow. She is dropping from straight state-bred maidens, should have no problem with the distance and has a better pace figure as a two year-old than any other horse has as a three year-old. At 6-1 it is tough to ignore her. By now everyone who has a sniff of interest in horseracing has weighed in on the comments from Steve Coburn, co-owner of California Chrome. after his horse was soundly whipped in the Belmont. While Coburn did himself no favors with the rant, perhaps some good will come out of it. The days of horses racing every two weeks are long gone. As I noted in my last blog, modern thoroughbreds simply aren’t up to the rigors of the Triple Crown campaign, and it’s about time we recognized it. Just because Secretariat, Seattle Slew and Affirmed all won three races in five weeks doesn’t mean it has to be that way until the end of time. If tradition is the best reason you have not to progress, just call yourself what you are – lame. Things change, and either you change with them or go extinct. Would it really diminish the accomplishment of the Triple Crown to have the Derby the first Saturday in May, the Preakness on Memorial Day weekend and the Belmont on the 4th of July? You extend the Triple Crown hype from five weeks to two months. How can that be bad for horseracing? You don’t force young, physically immature horses to do something they’ll never do again in their careers – race three times in a month. With pressure coming from more than PETA to treat horses better, what move could be better than not punishing young horses? Horses can still have plenty of time to get ready for the Travers and the Breeder’s Cup. It generally addresses Coburn’s complaint. California Chrome is a much fresher horse in an Independence Day Belmont and can better deal with the fresh challengers. Seriously. Do you really think the accomplishment of winning three Grade 1’s in two months is tarnished because the horse didn’t do it on the same schedule as Secretariat? Do you honestly believe that some good but not great horse will win a Triple Crown? Maybe we could do a Roger Maris and put an asterisk on his Hall of Fame plaque. The likelihood of horseracing adjusting has about the same probability as stability in the Middle East. But, hey, stranger things have happened. Are Route Races on the Way Out? For 52 years the Mother Goose Stakes was run at 1 1/8 miles; however, in 2010 the distance was cut back to 1 1/16 miles. Are there any reasons other than horses are less sturdy and more and more being bred for speed at shorter distances? The development of the thoroughbred breed was done with the idea of producing animals with both speed AND stamina. The thoroughbred was a unique cross – the fastest land animal at the distance of one-mile. Indeed, until the 1870’s thoroughbreds would regularly run best-of-three four mile heats. John Eisenberg’s The Great Match Race was a beautifully written chronicle of the famous four-mile race between Eclipse and Henry. In the last 50 years do you recall a race that actually increased in distance? The phenomenon of running shorter distances seems to be more common to America than Europe where stamina is still a desired characteristic. The question is, should the betting public care? My opinion is, yes. First, races beyond 1 1/16 miles require not only speed and stamina, but strategy. Often a short sprint overvalues how quickly a horse breaks and leaves horses who break poorly with no winning potential. Run fast, don’t get caught is less a strategy than a default for too many horses. How sad is it when your horse runs a 46.2 half in a 6-furlong race and gets passed by three horses at the eighth pole? How frustrating is it when the best horse breaks a beat slow from the one post and loses all chance 50 yards into a race? On the other hand, how great is it when you watch jockeys mete out a horse’s energy so he gets the maximum from that horse? Second, breeding for faster and faster horses inevitably weakens the breed. Top flight thoroughbreds who once could comfortably race 10-15 times a year are now carefully managed to race 5-7 times. The great Secretariat came to the Kentucky Derby having run 12 races. He fit 12 races at seven different tracks into a three year-old schedule that lasted only eight months. Today you run a horse 12 times in eight months and you picque PETA’s interest. Just for fun I looked at the Belmont card for June 28. 73 horses went postward. Exactly two of them had 12 or more starts in 2013, and if I had chosen 14 starts instead of 12 that number would have been zero. In the featured Mother Goose, the TOTAL number of starts for the five three year-old runners was 30. That’s an average of six starts for an entire two year-old and half of a three year-old season. My local track, Arapahoe Park has eight thoroughbred races tomorrow. One is at a mile, two are at five furlongs, three are at 5 1/2 furlongs, one is at seven furlongs, and one is at six furlongs. And that is typical of most small, western tracks. My point there is, at shorter distances in shorter fields, it’s hard to find something that outsmarts the crowd. The puzzle at five furlongs is more likely going to be easier than at 1 1/8 miles. It becomes far more difficult to find overlays. There was a time when it was pretty much a given that a horse off more than 30 days was a throw-out. Now, if a horse comes back in less than 30 days, it is too quick. You tell me. Is it easier to handicap races where horses have plenty of recent form, or where they’ve all been off one to six months? Horse ownership is down by a quarter since its peak. Is it any wonder given how few races a thoroughbred is likely to win? Even with bigger purses, a horse still eats 365 days a year. We’re not likely to go back to the good old days. Handicapping, like everything else, is Darwinian. Adapt and survive. Get used to it. More fragile horses running shorter and shorter distances less often is the future. Are you thinking about betting the second at Belmont today? If so, you have the choice of win, place, show, exacta, quinella, trifecta, superfecta, pick-3, pick-4, AND a double. That’s 10 separate pools into which you can spread your money. If that isn’t enough, you can get into the pick-5 in race 1, the pick-6 in race 5 or perhaps the coolest bet in racing, the Grand Slam in race 6. I guess the theory is that all those choices cover every type of bettor who might show up, and for large tracks with large handles it may work, but at smaller tracks it’s a bad idea all the way around. And remember. Most people don’t have a computer program identifying pool inefficiencies. The vast majority of the race day crowd relies on habit or experience to get into a pool. When Arapahoe Park reopened in 1992 after an eight year hiatus they made a great decision when they decided to drop the quinella and instead offer a $1 exacta box. Same two dollar bet and a collection as long as your horses finished first and second in either order, and it accomplished something important. It made the exacta pool larger than it would have been otherwise, and at smaller tracks pool size is critical. At that time dog racing in Colorado was king, and the king of dog racing bets was the quinella. People were literally flummoxed by the absence of the quinella, complaining to the point where Arapahoe was forced to eventually bring it back. It’s been downhill from there. As someone once said, you can’t save people from themselves. Even if you couldn’t make a $1 exacta bet, quinellas shouldn’t be offered. How many times have you seen the longer shot win the race and have the quinella pay $20 and the exacta $60? The point is that when the longer shot wins, you want a premium for your combination bet. With a single first/second pool, you have a much better chance at getting a fair pay. Plus you don’t have to go through the mind numbing exercise of checking the payoffs in two pools to figure out where the inefficiencies are (assuming you don’t have some software doing that for you). The last point is that at the smaller tracks, too much of the action happens in the last five minutes and the pools can be highly volatile as bettors search for the overlays. At least if there is only one pool there is a chance the pool might stabilize a little sooner and you’ll come closer to getting the payoff you expected when you bet. Frankly, the quinella should go the way of the horse and buggy. Tracks should weather the storm and eventually people will forget the quinella. The next bet they should get rid of is the show bet. The show bet caters to two segments of the betting public: people who go to the track with $20 and want to come home with $20 and the big dollar bettors who are happy to take 5% on their money. It’s a 19th century bet, which makes little sense considering we are well into the 21st century. You want to make the stingy bettors happy? Have a win pool and a combined place/show pool like you see in venues outside the United States. Again, at the smaller tracks, this can only help stabilize pools. Other bets can be offered based on track handle. Saratoga, Belmont, and Santa Anita can pretty much offer as many bets as they please, even though they still dilute pools unnecessarily. Still, remember that most of the super-exotic pools are dominated by the rebate sharks, and most of the betting public is simply donating to their cause. I would argue all day long that one gigantic exacta pool benefits big and small bettor alike. The larger tracks have a built in dilemma when it comes to which bettor to cater to. The small player has a much better chance at hitting the easier combinations – doubles, exactas, maybe even trifectas. But as you get to the more exotic bets such as the superfecta or picks-4,5,6, small bettors are most often just donating money to the pool. For every “small guy hits pick-6 with $32 ticket” story, there are a hundred where some whale investing $15,000 hits it. There are 5,040 combinations in a 10-horse race superfecta. Even if half of them are improbable, who has the bankroll to cover 2,520 combinations, even at 10 cents a ticket? This problem is exacerbated at the small tracks. At Arapahoe Park yesterday, the total handle was around $68,000 for 11 races. That’s not $68,000 a race. That’s $68,000 total. The superfecta in race 11 paid $627.60 for a 7-3-ALL-ALL ticket of which there was exactly one $2 (or two $1) ticket holder. Arapahoe doesn’t have 10 cent superfectas because, as they discovered, the total pool would be about $200. This also means if you had the 7-3-5-ALL or the 7-3-5-4 you would have collected…that’s right, $627.60. How much money should you put into a pool where you will collect $627.60 if you snag the whole thing? Arapahoe offers superfectas because everybody else does, but frankly they would have been better off just building the trifecta or exacta pools. I know this is unkind, but I have pretty much never run into an ardent racegoer who doesn’t complain that management may understand the actual operation of a track, but precious few actually understand the pari-mutuel aspect. The standard answer to any question is, because that is what the fans/owners/trainers ask for. They are helpless against the onslaught of those who demand 10 betting pools a race. Offering a ridiculous number of pools is not in the interest of the average bettor. The only time they prosper is when the favorites come in. Otherwise most bettors are just feeding the anti-Robin Hoods – stealing from the poor to give to the rich. Ray Paulick quoted Charles Cella, Oaklawn Park track owner in 1988 opining that exotic wagering was the worst thing in the world. That’s a silly opinion, but the larger point is well taken. Too many bets pull money away from the pools where the average bettor may have success. I’d challenge the larger tracks to undertake an experiment. Take a Wednesday and have win and place/show betting, exactas, and trifectas on every race, three pick-3’s, one pick-4, two daily doubles, two superfectas and a pick-6. With Untapable looking like a a very short-priced single in the fourth race, the question is whether we can come up with some price horses in the other three events to make the investment worthwhile. The second race is a bottom level maiden claiming dirt sprint where five of the nine runners are NY breds and there are two first timers. I feel fairly confident pitching Naughty Matilda, Chichita, and Desert Valentine. #9 Tordita is almost certainly going to be the post-time favorite. She seems more suited to the dirt than turf or synthetic, the combination of trainer Bruce Brown and jockey Javier Castellano is hitting at a 30% rate, and her figures are tops in this field. #7 Moon Map has done her best running on a fast dirt track, and has figures slightly below Tordita. She should be one of the runners coming at the end. #1 Discreet Malena is the interesting horse. I don’t think she’ll go off at 10-1, but she does seem to be racing into shape. She had two total clunkers on the turf in 2013, but came out on the dirt in 2014, showed some front in her first start and held her speed well in her next start, beating #2 Hot On Ice in the process. If she’s rounding into the top of her form she may just wire this cheap field. The third race is one of those open $40,000 claiming toughies at 6 furlongs on the turf. Eight runners are scheduled to start, and I’m not sure anyone is completely outless. #1 Chelsea Road is listed as the 2-1 favorite, but I’m going to give the nod to #4 Harbingerofthings. The 5YO mare is well suited to the turf and in 2013 was a steady earner with 6 of 11 in the money. Her last two races showed approaching condition, even though she was racing on a muddy Pimlico surface and the synthetic at Presque Isle. I think today she is back on form and I’m expecting Michael Trombetta to have her wound up and ready to run. There is not a lot of pure speed in the race. #2 Kilknockagain and #3 Starship Gambler will probably inherit the front, with the rest of the field following in close order. It should be a wild finish and I’d just be guessing if I offered a cold trifecta. The last leg of the early Pick-4 is a $40,000 Maiden Claiming event for fillies and mares at 1 1/16 miles on the turf. It is another mess of a race, and a case can be made for a number of runners. #5 Winner’s Legacy is listed as the morning line favorite. She has the past performance of a horse with physical issues, and her last three races appear uninspiring at best. I’m going elsewhere for this race. In this sort of race I look for horses that have a small number of starts and something positive going for them. The closest prospect is the #1 Acrostic. In May 2013 Acrostic gave a bang-up effort in a $65K maiden claimer, and then spent a year on the sidelines. She returned a month ago in a six furlong sprint, breaking slowly but making an encouraging five-wide move around the turn and finishing with decent energy. Acrostic’s chances may depend on the break, but if she establishes a good tracking spot going into the first turn, she has every right to wind up a winner. #2 Lifeguard on Duty also has the pattern, although she seems a step behind Acrostic. She ran a good race in her last run of 2013 at Laurel, and Anthony Dutrow is a high percentage trainer who does well with horses coming off long layoffs. #8 Shaikha and #4 Kevin’s Kool Kat both have the look of professional maidens. Too many starts, and a high percentage of second place finishes, although Shaikha clearly has the best numbers of the field. None of the remaining runners has much to recommend. Six horses are scheduled to contest the 2014 renewal of the Mother Goose Stakes this Saturday at Belmont. The overwhelming and deserving favorite in this field of six is the Steve Asmussen trained Untapable, listed at 1-5 on the morning line. 1-5 translates into an 83% chance of winning. If you are intrigued enough by the other horses to take a stand against Untapable, you are assured of a decent return for an upset. The problem is, nobody seems to be in Untapable’s current league. Untapable made an auspicious debut at Churchill Downs last June as the 2.40-1 second choice, comfortably winning a 5.5 furlong race. She wheeled back two and a half months later, taking the Grade 2 Pocahontas. She followed that with a disaster in the Breeder’s Cup Juvenile Fillies, and finished 2013 with a rather dull effort in the Hollywood Starlet. What a difference 2014 brought. Untapable has won three consecutive Graded stakes, the last win coming at Churchill Downs in the Kentucky Oaks. Nobody has been closer than four and a half lengths at the wire. Untapable should be fully primed on Saturday. She is a versatile runner and has shown the ability to press or track and leave a field in her wake. Are there any negatives? Not many. Rosie Napravnik, Untapable’s regular rider, is out with a shoulder injury and has been replaced by the very capable Johhny Velasquez. She has never raced on the Belmont surface, and it is occasionally the case that a horse will find the Big Sandy less to their liking. So if you want to play the race, what do you do? There is no show betting, but I don’t think the bridge jumpers will have any hesitation about slamming Untapable in the place pool. That leaves a few combination bets – the exacta, trifecta, pick-3 and early pick-4. In an article I wrote for Horseplayer Magazine, I mentioned that if you can turn a 1-5 shot into an 8-5 or higher shot by playing a cold exacta, or an even longer shot by playing a cold trifecta, it’s worth taking a plunge. So who would you put on the bottom of an exacta or trifecta with Untapable? Let’s go through the other runners. House Rules needed four tries to break her maiden, but then finished second in a pair of Grade 2 races at Gulfstream, finishing ahead of other runners America and Stopchargingmaria in the process. However, she showed very little in the Grade 1 Acorn at Belmont. Her closing style may work in her favor but given she’ll likely be bet a little, I’m going to look elsewhere. Princess Violet is a lightly raced New York state-bred with three sprint races under her belt. She should bolt to the front, but otherwise I’m not really finding a reason to consider her in the back hole. America is still eligible for a NW2 race and has been beaten by both Stopchargingmaria and House Rules. I can’t see why the tables might turn on Saturday. Stopchargingmaria is a solid Grade 2 horse and her win in the Black-Eyed Susan showed a lot of growth. She raced as a two-year old at Belmont, finishing a respectable third in the Frizette, so I don’t think the track will be a problem. You can’t ignore the Pletcher-Castellano combination. They consistently hit at 30% or greater in stakes races. She seems fairly clear as the second best runner, but it’s hard to imagine more than a $4 exacta with Untapable on top. Still, it’s a long way better than 1-5. The horse that intrigues me is Aqua Regia, and if Princess Violet wasn’t in the race I’d be inclined to really hit the Untapable-Aqua Regia exacta. She just won her NW1X race at Belmont, pressing from the second spot and finishing well. She has plenty of tactical speed, but doesn’t seem to be a “need to lead” type. If she doesn’t let Princess Violet burn her out early, she may have a couple of lengths on everyone but Untapable turning for home, and have enough heart to hang on to the place. She has the feel of one of those horses that still has a lot of room for improvement, and fits a pattern that has historically been successful at Belmont. Plus, she is likely to go off somewhere near her 20-1 morning line. I don’t think there are a lot of decisions in here. If Untapable runs her race, everyone else is competing for second, and the Untapable-Stopchargingmaria exacta will probably pay a miniscule price. Unless something intervenes, I’m inclined to try to make money by betting a straight Untapable-Aqua Regia exacta. I’ll blog tomorrow about the pick-3 and pick-4 prospects. How Can Racing be Saved? It was the early twentieth century. The industrial revolution had modernized the world economy. Workers not only had more money to spend, for the first time they had the leisure time to spend it. Baseball filled stadiums from Boston and New York to Chicago and St. Louis, propelling one George Herman “Babe” Ruth to the top of the “A” celebrity list. Jack Dempsey regularly fought in front of 100,000 rabid fight fans. And the sport that led the universe in attendance was horse racing. Four legged runners were superstars in every sense of the word. The incomparable Man O’ War had as much press as any actor and private protection that rivaled that of the President. Horseracing was not only the sport of kings. It was the king of sports. The list of mistakes made by horseracing is lengthy and well known. In a sport primarily controlled by America’s pseudo royalty, there were few visionaries and an arrogance that created denial of the steady but sure decline of racing’s dominance. Racing is under attack from a variety of quarters. The relationship between “gambling” moralists and horse racing has always been uneasy. More puritanical interests have always frowned on the idea of betting on any type of sporting event. PETA (People for the Ethical Treatment of Animals) makes no secret about its desire to plunge a dagger through the heart of horseracing. When the New York Times published the results of an undercover PETA investigation involving mega-trainer Steve Asmussen and his top assistant, Scott Blasi, the anti-horseracing folks started salivating like Pavlovian dogs. It was the same old accusations. They subjected their horses to cruel and injurious treatments, administering drugs to them for nontherapeutic purposes, and having one of their jockeys use an electrical device to shock horses into running faster. PETA filed complaints with federal and state agencies in Kentucky and New York saying Asmussen “forced injured and/or suffering horses to race and train.” When you read that, was your first thought, we need to do something to fix horseracing, or did you just figure it was one more “business as usual” moment? Remember the Pick-6 scandal at the 2002 Breeder’s Cup? More definitive “proof” that horseracing is riddled with corruption, despite the fact it was only three greedy morons who were exposing a flaw in the Amtote system. Check out this article on banking scandals to read about the 10 biggest banking scandals of 2012. That’s ten big scandals in one year. Do you hear anyone talking about shutting down all the banks? Do I think there isn’t cheating? Of course not. There is cheating in almost any industry where lots of money is changing hands. If you believe racing is corrupt but the stock market is 100% on the up and up, I’ve got a bridge I’d like to sell you. Do I think that there isn’t cruelty being inflicted on animals, especially at smaller tracks, by marginal trainers? I know for a fact such cruelty occurs, often being accepted as a necessary evil to fill races. And sometimes it is not limited to marginal trainers. The enormously successful trainer Richard Dutrow Jr. was suspended 10 years in 2013 for repeated violations. If you follow the stewards activity at any track there are plenty of rulings, most of which are for petty transgressions. The problem is that while the rulings are public, for the most part the public is generally unaware of the activity. Most often the only time punishment makes the news is when something like Dutrow occurs, and it gives the appearance of an endemically corrupt business. Horseracing is dying, and the sport has no one to blame more than itself. The number of thoroughbred foals has declined from more than 51,000 in 1986 to around 22,000 in 2014. This leads to fewer horses available to fill races and more pressure on trainers to keep their horses race-available. The number of race starters has dropped by almost 25% since 2007. The number of registered owners has decreased by 25% in the last 10 years. It is a vicious circle . Fewer horses to fill more races leads to more drugs leads to fewer horses to fill more races. As I mentioned in a previous blog, some in the racing industry are looking to Congress to provide them with enough credibility to sustain racing. We all understand the frustration, but do we really want the current Congress to be inserted into the game? Does the NFL or NBA turn to Congress when they have a problem? That is the last thing they would want to do. I don’t know that I have a unique solution, so let me reinforce the one that seems best. Horseracing needs to follow the model set by the other professional sports. A single governing authority with an appointed commissioner who has the same type of powers granted to the other major sports commissioners. Any track that doesn’t want to join gets penalized by being refused any simulcast signals. There would be uniform agreements with owners, trainers and jockeys, and jockeys would be treated more like valued employees rather than disposable plug-ins. The consortium would issue uniform drug rules and enforcement, including a three strikes rule for violations of drug policies. There would be uniform rules for fouls and disqualifications and suspensions, and mandatory training and certification for the stewards who have to make on the spot decisions. Every member track would be given assigned operating dates. A reasonable and uniform take for all tracks would be set and a uniform division of that pie would apply. Yes, that would limit the ability of tracks to “compete” with each other, and that is the point. Tracks need to be competing with casinos, state lotteries, and poker rooms, not other race tracks. The charge for simulcast fees for the low budget rebate shops would be a premium, meaning rebates could be in the more tolerable 3-5% range. We wouldn’t see the rebate whales skewing pools just to elevate their action. They’d actually need to become competent handicappers. No more “off the top” revenues for states. The state taxes the tracks as they would any business by making them pay a percentage of their profits. The state slice off the top is done under the guise of needing to pay for state oversight, but if there was a national governing body, they would take over all those functions and the state wouldn’t be in the testing, judging or veterinary business. Race tracks become just another business in the state, and policing would be just like the pro sports leagues. And the biggest thing of all. Remember that any decision has to have the best interests of the betting public in mind and not just track management, owners, and trainers. Enough with the piecemeal approach currently in place. Someone comes up with an idea to have a uniform drug policy, and then they have to sell it to 38 separate jurisdictions. Ogden Mills Phipps, chairman of the Jockey Club, noted that the current state by state approach is going slowly. In this case slowly means, not at all. One consortium with one set of rules is the answer. The Jockey Club has suggested “thoughtfully” reducing the number of racing days. I love those kind of qualifiers. Thoughtful, expeditious, efficient – they only mean what those in control need them to mean. Remember the famous Garrett Hardin essay, The Tragedy of the Commons? Just like those who might graze cattle on an open range will keep adding cattle until the range is exhausted, race tracks will operate in their own self interest to the exclusion of the good of the sport as a whole. But how does the National Football League avoid this problem? They limit the number of teams that can be part of the league and they do the most important things of all – they share revenues and cap personnel costs. Hardin calls this, “mutual coercion mutually agreed upon.” And pretty much every team, big market or small, makes scads of money. In 2013 race track handle was almost $11 billion. With the right number of tracks and the right revenue sharing formula tracks and simulcast facilities should be able to figure out a way to prosper. There needs to be an effective marketing branch, and more often than the Kentucky Derby and the Breeder’s Cup.There needs to be a concerted educational effort. It is really hard to be a good handicapper, and most people give up before they get started. These are not the only ideas. Why don’t you tell me your ideas for bringing horseracing back to prominence. If we don’t fix horseracing now we may not have a sport to fix. The first track to offer bonuses to trainers for racing their horses free of medication on race day is…Arapahoe Park right here in colorful Colorado. Essentially the only medication covered is Lasix, the ubiquitous diuretic designed to control nasal bleeding that results from extreme effort during a race, since in Colorado it is the only drug allowable on race day, but, hey, it’s a start. There are a few conditions that must be met before a horse can receive the $1,000 bonus for winning a race. Only trainers keeping their stable at the track for the entire meet are eligible, and the money doesn’t get distributed until the meet is over, which I suppose is extra incentive to actually stay until August 17, the last racing day. Take note of that statement because it might be the first time the words “Arapahoe Park” and “ahead of the curve” have been used in the same sentence. Now if they will only replace the ancient betting terminals with something a bit more modern…. You’re right. That was sort of a cheap shot. Give them credit. They have a hard enough time filling fields and attracting horses, so it was a fairly brave move on their part. Now, let’s see how many trainers take advantage of the opportunity. It’s easy to be cynical about the idea of medication-free race days. Remember that New York held out on Lasix until 1995, but buckled under the weight of horsemen who refused to race their stables there. Nothing has changed, and when Sen. Adriano Espaillat tried to introduce a bill in 2013 banning performance enhancing drugs, including Lasix, at New York tracks the horsemen were close to unanimous in their opposition. The drug discussion is really a surrogate for the real issues. Tracks cannot fill fields with horses that are totally healthy. Trainers cannot afford to fill limited stable space with runners who can’t earn on the track. The problem is simply that the balkanized racetrack model creates a demand for horses and there are not nearly enough healthy runners out there. So trainers hold their horses together with liniment, bandages, bute, Lasix and drugs with names you need to be a pharmacist to pronounce, and help make a race go. The discussion is centered on absurd things, like bringing in the U.S. anti-doping agency to monitor race horse drug testing. It is centered around statements made by pretty much every state racing commission that maybe there is cheating going on somewhere, but not in my state. It centers around getting Congress to intervene. I’ve said this before, but when you are so exasperated you think a Congress that can hardly agree on what day of the week it is is the answer, you bet you have a major problem. The discussion needs to center on the real problems. How do we improve the racing product? How do we make racing rules and drug policies universal given there are 38 states with 38 sets of rules to herd? And my favorite question, how do we stop treating the racing fan like a cash cow that is suppose to take anything tracks want to shove down our throats? Feel free to contribute your answers. In my next blog I’ll talk more about how racing can be saved. And here’s a hint. It doesn’t involve Congress. Churchill Downs recently announced they are increasing the takeout on both the win/place/show pools and the exotic wagering pools. In an amazing show of irritation, Jeff Platt, Lenny Moon and others formed www.playersboycott.org, asking players to not only stop betting Churchill Downs, but the CDHN owned tracks (Arlington, Fairgrounds, and Calder) and to not use the TwinSpires betting site. All I can say is wow! It only took 150 years to finally get pissed off enough to exercise the power of betting public. But better late than never. There is no doubt that in the hierarchy of racing, players are on the lowest rung of the ladder, well behind the state, horse breeders, owners and trainers, and track management. I’m not including jockeys and backstretch workers because they might actually be treated worse than horseplayers. The greatest impetus to the players’ boycott seems to be a startling 340% increase in executive compensation from 2012 to 2013. Churchill essentially concluded that they had to pay executives $19.7 million more even knowing they needed $8 million more in revenues for purse increases. I’m not saying the executives don’t work hard, but if your boss came to you and said, I’m cutting your pay so I can get a raise, I’m pretty sure some sort of revolt would be discussed. And in essence, that is what they are doing. Asking the bettors to fund increases in salaries and purses. I don’t know what they might have asked the owners and the trainers to kick in, but if I were a betting man (wait, I am a betting man), I’d wager the last thing on their list of options was additional entry or stall fees. Think about it for a minute. Who exactly is the customer at the race track? For every disgruntled punter who screws up enough energy to let management know how he feels, there are scores of owners and trainers who are griping daily. True story. I once witnessed a group of trainers confront a track general manager, and when they didn’t seem to be making headway, decided that a punch in the head could more clearly make the point. Amazingly, they got what they wanted. I don’t recommend trying the punch in the head approach unless you have a hankering to eat baloney and white bread sandwiches three times a day at the local hoosegow. Trainers and owners are like the Empire compared to the average Luke Skywalker horseplayer when it comes to management’s ear. When the tracks try to cater to horseplayers, it is usually by giving away bobbleheads or a foil lined thermo-lunch bag. Don’t take this as ungratefulness, but the only people who show up for the bobblehead are people who think they’ll be able to sell it on ebay or people who can’t resist a freebie. 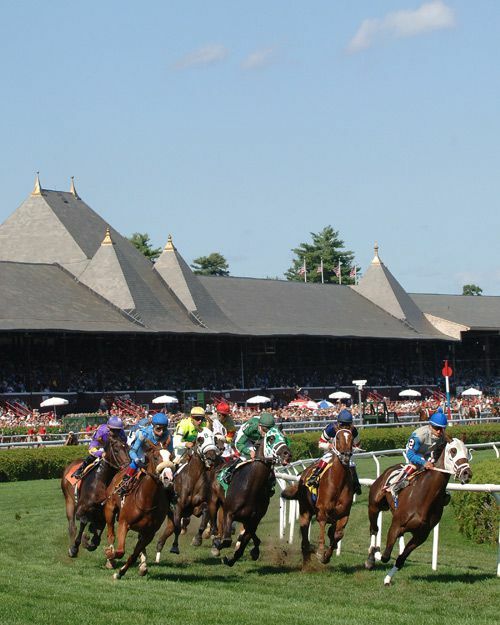 Saratoga is famous for its Sunday giveaways, and plenty of people show up, buy six admissions, grab six t-shirts or mugs or whatever, and leave without ever betting a nickel. If you want to make a regular happy, how about a comped comfy seat on Breeder’s Cup day as a reward for showing up every day and being 1% of your total handle. One of these blogs I’ll talk about the history of Churchill Downs, a track that somehow stumbled and bumbled through its first half century by regularly flirting with bankruptcy, and its irascible founder, Meriwether Lewis Clark, Jr . But that is for another day. Which brings me to the state. Is there a business other than gambling that pays its “taxes” before calculating its profit, and with no chance of a “refund” if it loses money? As Vito Corleone noted, “A lawyer with his briefcase can steal more than a hundred men with guns.” Think what a whole statehouse full of them might do. Bettors are also expected to pay for state breeding programs. Every state with horseracing designates a percentage of the takeout for the breeders’ fund for horses bred in that state, ostensibly to promote breeding and racing. The concept is to create an economic stimulus to breeding horses in that particular state. I’ll rant a bit more on this topic in a later blog, but I have real questions about the forced relationship between bettors and breeders. It feels like there is a hierarchy of middle men taking their cut from the same, no the only, piece of pie out there. The pari-mutuel bettor. The only analogy I can think of is the old protection racket. Pay us and we’ll let you keep betting horses, and if it gets to be too much…well, too bad. When I first started writing for Horseplayer Magazine I did a rant where I told this story. I was at the driving range hitting some balls and who should decide he also needed to work on his swing but the track general manager. In an occurrence that at least made you wonder about the reality of divine intervention, it started to rain and the two of us found ourselves waiting out the weather in the nearby shelter. We got to talking and I said something like, “and how about that 25% take on the exotics?” He said, “I know. That’s the maximum amount the state lets us take.” Truly a case of one person zigging while the other person is zagging. Back to the players’ boycott. It seems to be working. As of June 22, 2014 average field size is down 0.62 starters per race. (-8.13%). If you exclude Kentucky Derby and Kentucky Oaks days, total handle is down $45.6 Million (-26.90%), handle per race is down $111,316 (-21.68%), and average handle per day is down $1,424,385 (-26.90%). I’m going to weigh in on the side of the players boycott, mainly because it’s about time horseplayers got noticed. But I’m also going to say, even if Churchill rescinds the increase, it doesn’t solve the underlying problem. The current model hasn’t worked for decades and the problems of live racing have only been exacerbated by universal off track wagering, rebates and state laws crafted either by owners or track management in their own best interest. So what do you think? If you were the czar of racing, what would you do to bring the sport all the way into the 21st century? Fellow Denverite Derek Simon, blogging for www.twinspires.com, wrote an interesting piece about horse racing whales, those ultra-big money bettors. He seemed to make three important points. First, whales are not necessarily good handicappers. The second point was that whales survive by wagering large amounts of money often. So if a whale bets an average of $250,000 a week for 50 weeks out of the year, and sees a 2% return, he finishes the year $250,000 to the good. Now that amount is a good year for most people, but it seems like a lot of risk for a fairly small reward. You still have to be a 2% winner, assuming there are no intervening factors. Of course if making money was that easy, a lot more people would be whales. The third point is questionable – whales limit their play to the larger tracks and leave the action at smaller venues to the minnows. It doesn’t get much smaller than Arapahoe Park, and I’ve seen plenty of whale sized bets there. Same for Turf Paradise, Tampa Bay Downs, Mountaineer Park and a host of other small tracks. Simply put, 5% is 5% is 5% whether it is at Santa Anita on Breeder’s Cup day or Turf Paradise on a Tuesday in February, and a bettor is guaranteed at least 5% return on a winning ticket. Why would you avoid betting at Turf Paradise because you felt limited to, say, $10,000 bets? In fact, I might argue that at some of the smaller tracks the certainty factor is even higher than at larger tracks. Don’t laugh, but there are people I know who specialize in crushing Arabian and mule races at tracks like Delaware, Retama, Arapahoe Park and Pleasanton and are deliriously happy with a cold $7.40 trifecta, which by the way pays $7.40 because they have a substantial percentage of the pool. Ask any Wall Street investor if he’d take 5-2 on a 90% shot. The conclusion of the blog is don’t get too hung up on the action of the whales because mostly they are betting against each other. Derek also suggests that the rebates are irrelevant and that is where I want to zero in. In 1968, Richard Carter using the pseudonym Tom Ainslie, published the seminal work, Ainslie’s Complete Guide to Thoroughbred Racing. On page 38 he talks about The Magic Number. Basically Ainslie suggests that no one should lose more than the track take on the win pool. So if the take is 17%, at worst, even if you are betting randomly, you should lose no more than 17% of your bankroll in the long run. He goes on to say that if you only bet favorites, you can reduce that loss to around 8%. Now imagine you are a whale getting a 10% rebate. Betting only favorites to win, you do two things. First, you skew the pool by making the favorite all but unbettable. Second, you still make a 2% profit. Think about it. You are an 8% loser making money, and the more you bet the more you make. If you are any type of handicapper, or if you are using a sophisticated betting program, you might erase half of that 8%, making you a 6% winner. Our same $250,000 a week whale would net a cool three-quarters of a million dollars. Back when Ainslie wrote his book, favorites were winning at about a 32% rate and one of the first four choices won around 78% of the time. Today, the dilution of the racing product has resulted in smaller fields and a higher percentage of favorites winning. The modern percentage is close to 35%, and at the smaller tracks it seems like there are an increasing number of days when favorites win all the races. Rebate whales affect the pools and sooner or later they are going to make your return on investment lower than it would be otherwise. That is bad enough, but they negatively impact the industry as a whole. Ten years ago the New York Times published a short piece on how rebate whales affect the industry. They documented that since the advent of the rebate shops, purse money was declining even though handle is increasing. Is there another viable explanation? It doesn’t seem likely. So what do the tracks do? They think about raising the take, and guess who suffers the most? That’s right, the millions of patrons who aren’t whales. According to the NTRA, money is leaking out of the system and it isn’t going back to live racing. Instead, low overhead operations pay for the signal, make their profit on the volume of bets, and cater to the big money whales. What’s the answer? I’m going to ask you to tell me your thoughts. Tell me what you think about whales, rebates, and how tracks are dealing with them.